This interdisciplinary seminar series on visual and material culture is for anyone with interest in this field across different departments at UBC and beyond. It is an informal forum to share research and exchange ideas, usually followed by conversations over a drink at Koerner’s Pub. Open to students, staff, faculty and community members in and around UBC. 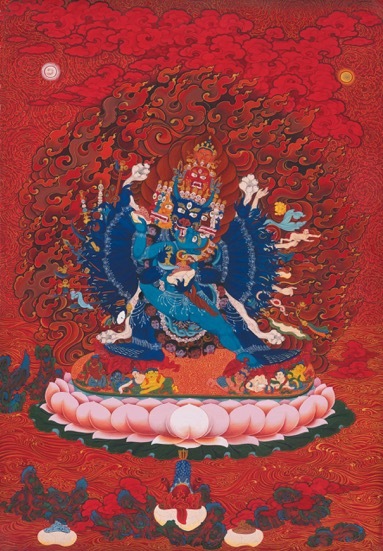 Kalsang Dawa grew up in Lhasa where he was trained in traditional Tibetan art. He later moved to Dharamsala, India, and had a rigorous thangka painting training under Master Venerable Sengye Yeshi, the former official painter of the 14th Dalai Lama. In 1998, Kalsang moved to Vancouver, Canada. MOA commissioned him to create a work for the museum in 2009. Inspired by Buddhist philosophy, he uses, and teaches art for healing and self-awareness. In this talk, he will present his recent contemporary art works. Open to all, and free. No registration required. Located near the MOA administrative entrance to the right to the main museum entrance and MOA café. Dr. Fuyubi Nakamura, MOA Curator, Asia, Dr. Nuno Porto, MOA Curator, Africa & Latin America and Dr. Anne Murphy, UBC Asian Studies.